Outstanding durability at a minimum weight. 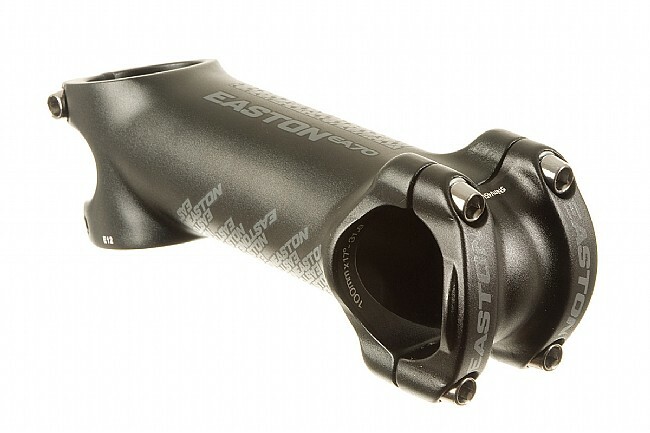 Sporting a new four bolt design and "Top Lock technology" the EA70stem is a durable favorite of racers of all level. As light as many carbon stems, 3D forging and shot-peen finish put the EA70 in its own class of performance and strength. Easy to install and really improved the fit of my bike to my body. Solid stem, does the job for a fair price. I like that it's carbon-friendly, so you can run your finger over the internal edges and they're all smooth. Have always liked products I've gotten from Easton and this one is no different. I put this stem along with their matching flat handle bar on a single speed bike. It looks good and fits the project perfectly. I would recommend this product to anyone. Had this on my bars for a month now, and I do have to say, I was originally a little skeptical about the clamping system. A month later, this seems to be of no issue at all. Stiff and holds bars securely into place. Highly recommend! It's a solid, workable, not flashy stem. Stiff and inexpensive. The cutout edges in the steerer clamp are rather sharp and can scratch carbon steerers. Not lightweight but that's why it's stiff and inexpensive. The bar clamp is a bit wide so if you're using clamp-on aerobars you will not be able to set them up as narrow as compared to a ritchey wcs for example. I have this stem on all my bikes. It is well made and stiff enough for me. I am 6 feet tall and 205 lbs. I ride about 6000 miles a year. I have never had any issues with this stem.